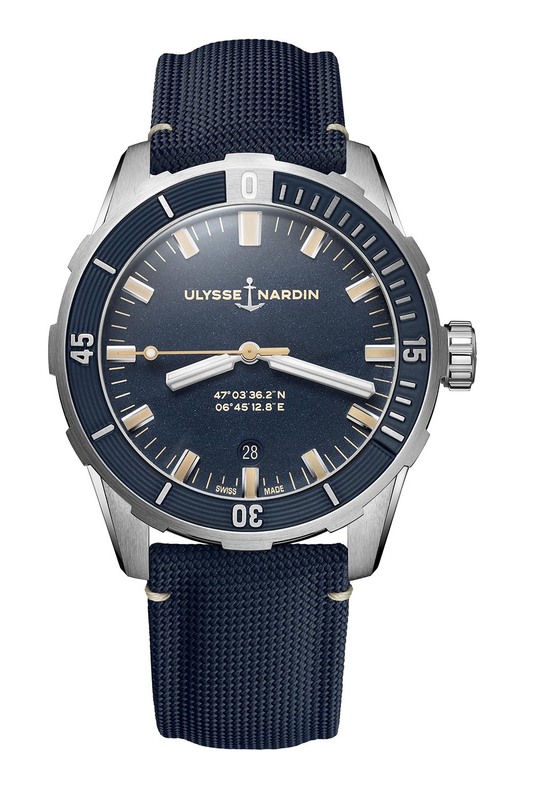 This neo-vintage styled dive watch is the new portal to Ulysse Nardin collections. 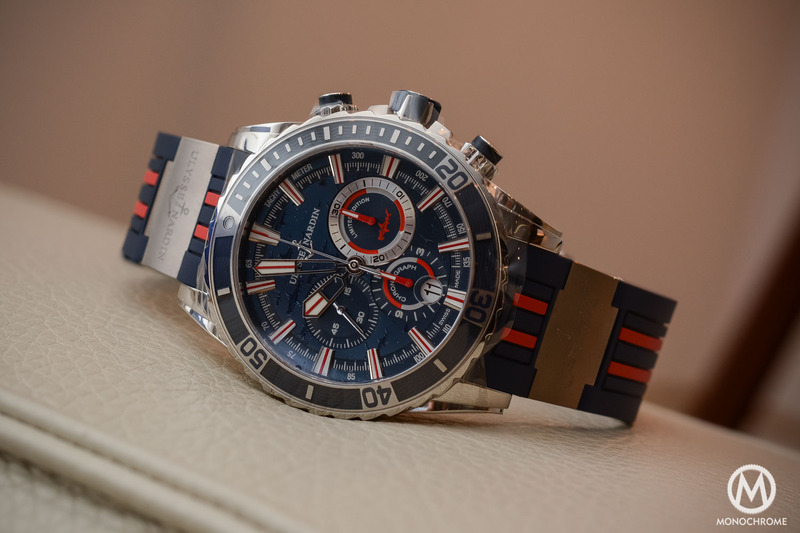 Just a few weeks ago, on the occasion of the Monaco Yacht Show, Ulysse Nardin unveiled its new Diver Chronometer, a streamlined and cleaner take on the emblematic model. This collection is now complemented with a smaller 42mm model (vs. 44mm for the Diver Chronometer). Most importantly, not only does the diameter change, but this watch will be the new entry-level piece of the brand. 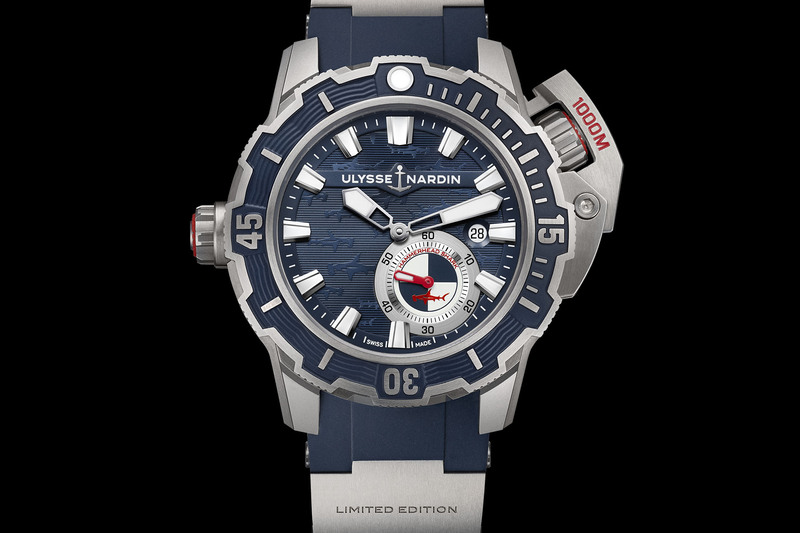 For those looking for a Ulysse Nardin watch, the new Diver can be yours for CHF 5,800. 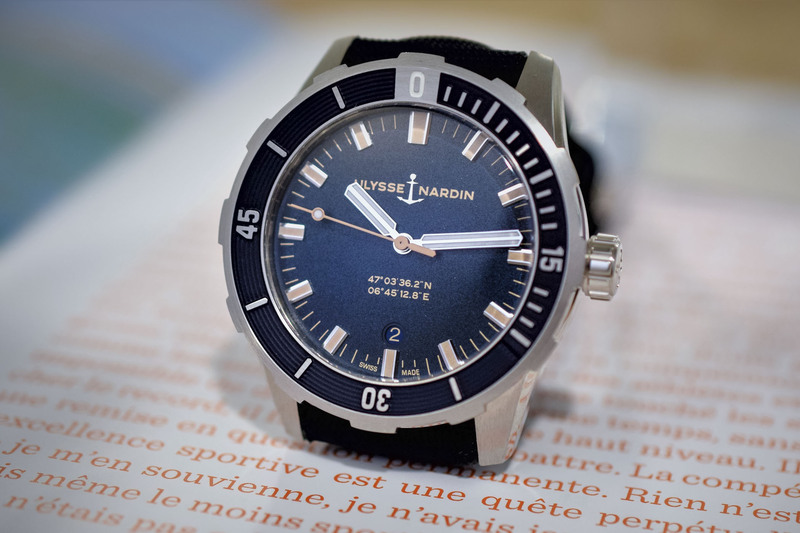 Let’s take a closer look at the new Ulysse Nardin Diver 42mm. If the design inspiration remains the same, with a concave bezel and a domed sapphire crystal, the new Diver 42mm is not just smaller. This three-hander has a cool neo-vintage look. The uncluttered dial has a pleasant grained texture with a sand-blasted finish and retro-styled beige indications. 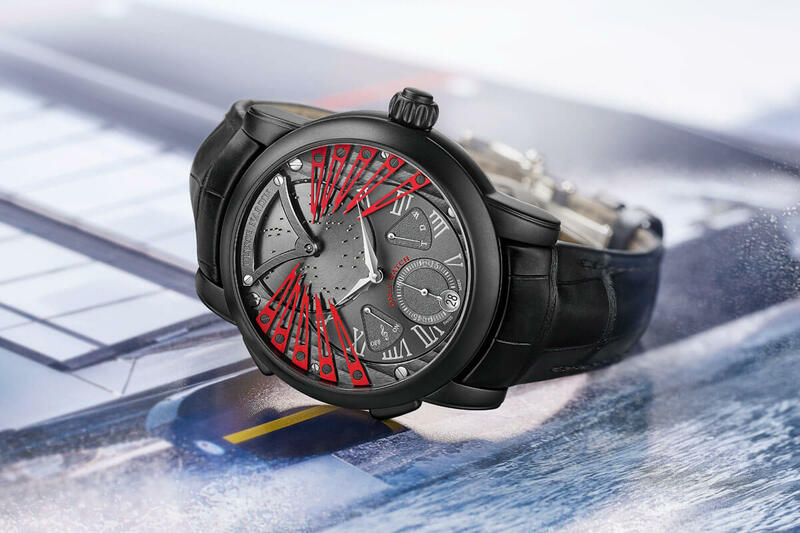 It also includes a surprising line of text, which actually is the longitude and latitude of Le Locle, Switzerland, the hometown of the brand. 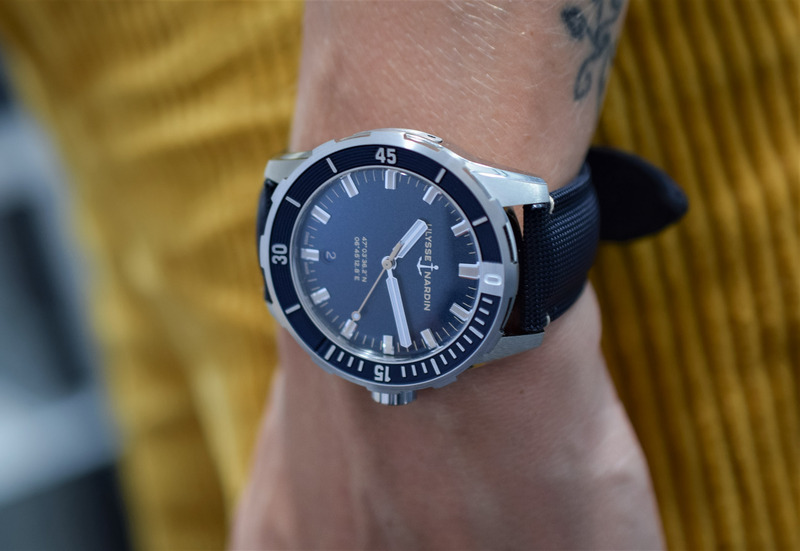 As you would expect from a dive watch, the new models feature luminescent hour markers and hands, a unidirectional bezel with a 60-minute scale and the appropriate water-resistance (300m). 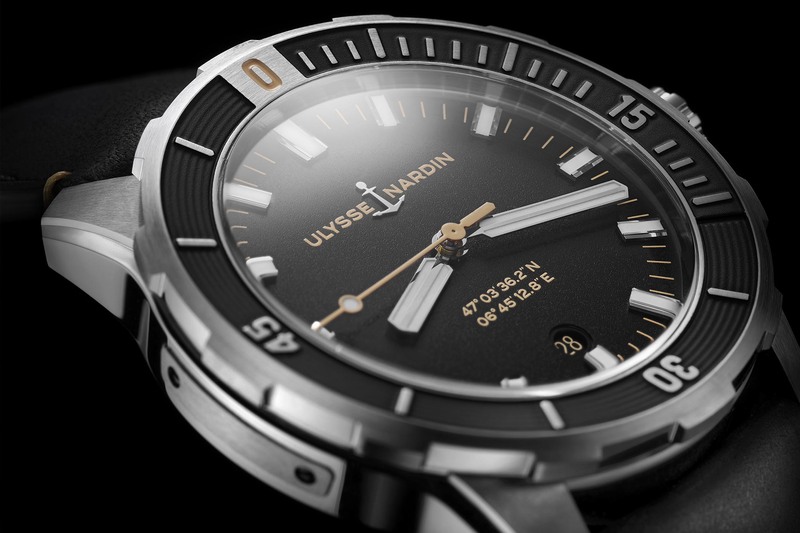 The case of the Ulysse Nardin Diver 42mm has also undergone a subtle redesign. Certainly, it now measures 2mm less in diameter but that’s not all. It has been “toned-down” with no more protective device around the crown (for a more discreet and more retro style) and the lugs are also slightly slimmer. 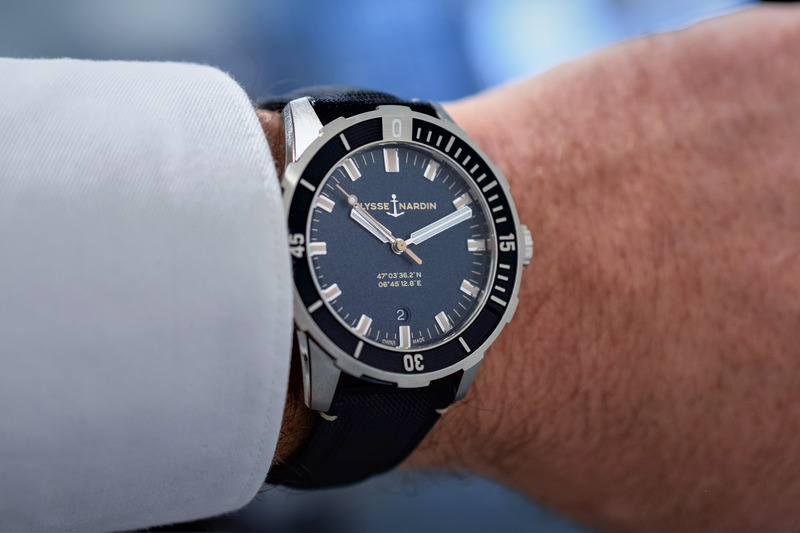 Yet, the signature elements of the UN Diver, such as the stepped lugs, the combination of brushed and polished surfaces, or the larges notches on the bezel, are still present. No more integrated rubber strap either, as Ulysse Nardin chose to be more classical here. 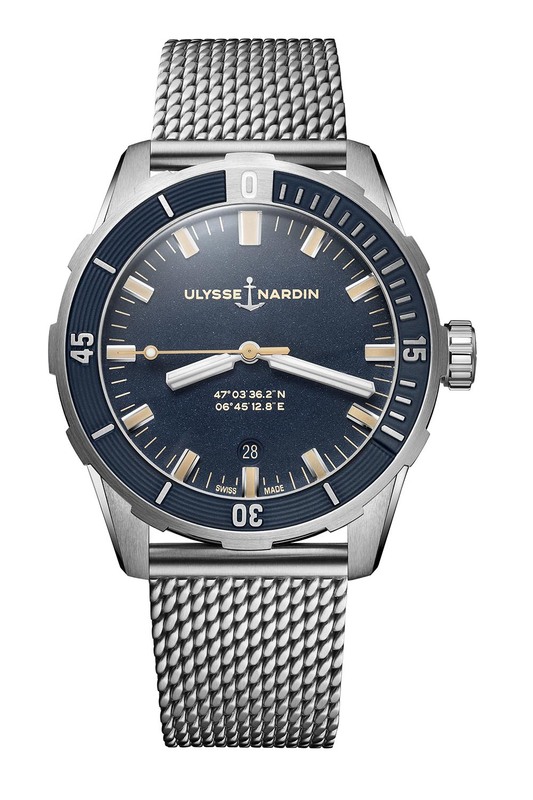 Powering the new Ulysse Nardin Diver 42mm is the automatic calibre UN-816 with hours, minutes, central seconds and date (a relatively discreet window at 6 o’clock). This movement is based on a Sellita SW300, extensively modified by Ulysse Nardin to incorporate in-house silicon components for the regulating organ. Operating at 28,800 vibrations per hour, it boasts a 42-hour power reserve. 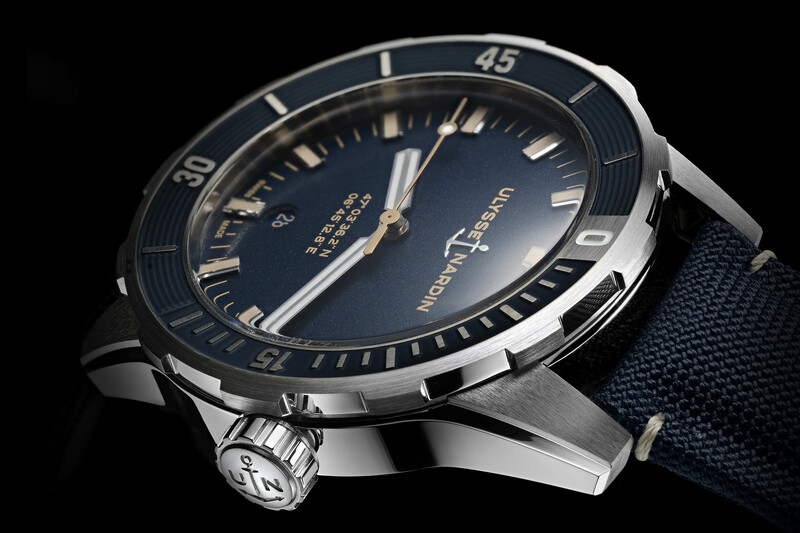 The solid caseback is engraved either with an anchor motive or a shark (for the blue shark edition). There is a wide range of straps to choose from: textile or calf leather straps in black or dark blue. 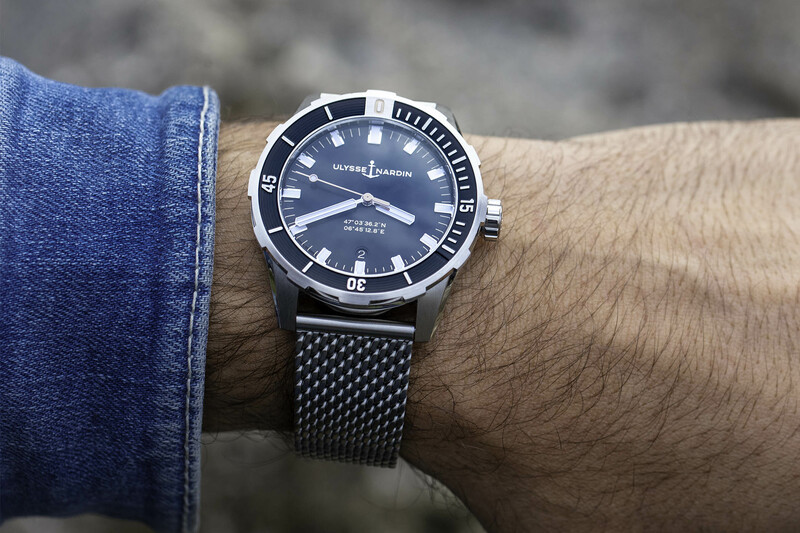 The watch can also be worn on a Milanese mesh bracelet if you are up for a more steely, offbeat yet stylish option, or on a classic diver-styled steel bracelet. 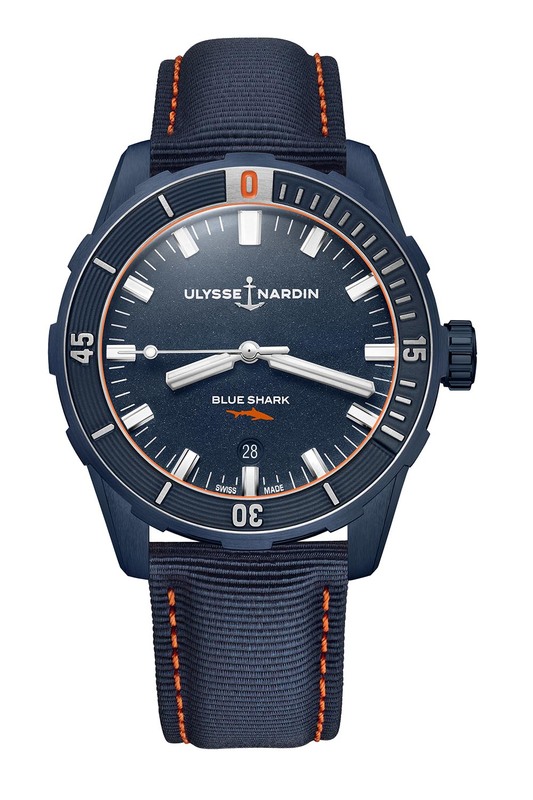 Last, there is a Blue Shark limited edition (300 pieces) in blue PVD-coated steel with orange accents. The Ulysse Nardin Diver 42mm retails for CHF 5,800 on textile or leather strap and CHF 6,500 on a Milanese mesh bracelet. 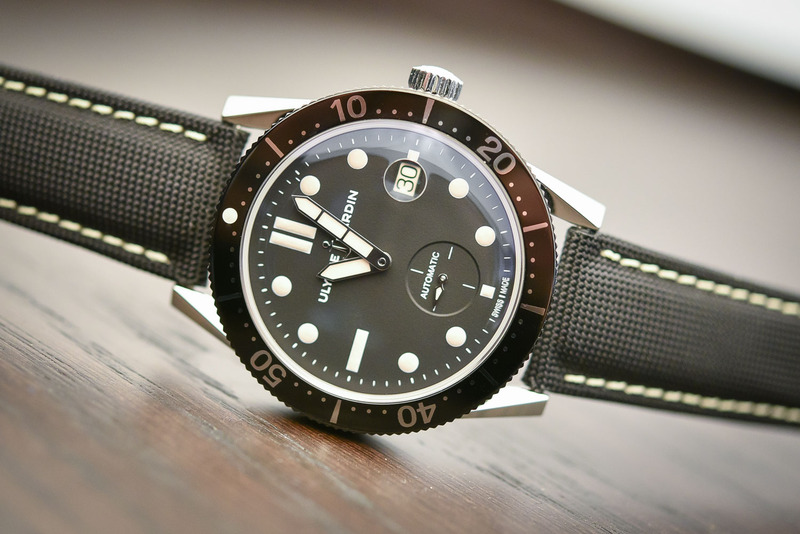 As a comparison, the Diver Chronometer 44mm with in-house movement comes in at CHF 7,900 on a rubber strap. 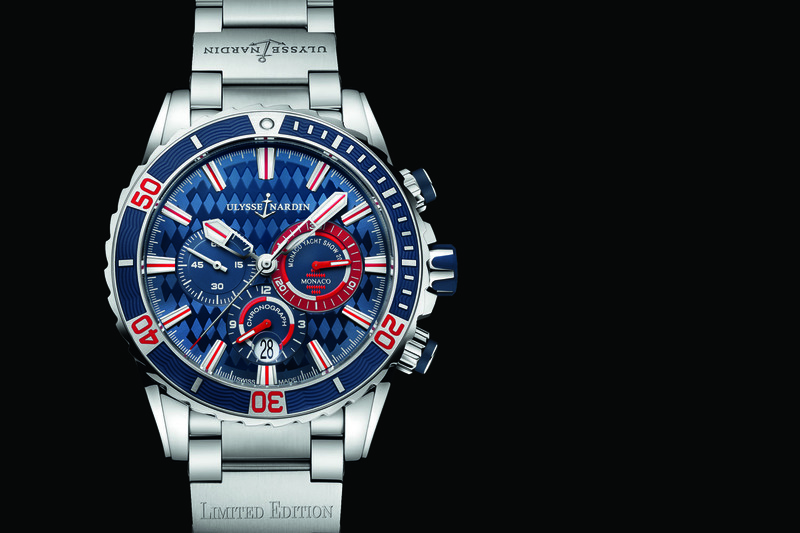 The Blue Shark limited edition retails for CHF 6,800. For more information about the new Diver 42 mm watches, please visit www.ulysse-nardin.com. If they do a GMT, I’d be very interested..
Podrían montar Miyota, ya puestos. Meistersinger lo montar y no pasa nada. Yeah, the Sellita would put me off this one despite looking great and being a more desirable size. 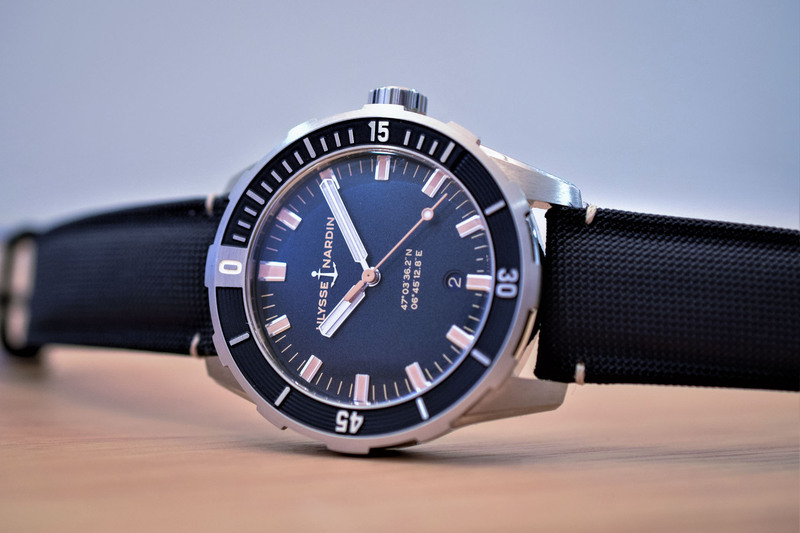 The Chronometer model, on the other hand, is up there with Blancpain’s FF Milspec as one I’d consider getting if I ever ventured into deeper waters than my bath. I don’t see the Sellita to be a problem. Before, the UN divers had an ETA 2892 and these were excellent watches. Other mnufacturers, too, used that movement and are now equipped with Sellita-based movement, expecially in ther entry level models. I am more put off by the design copies of various IWC watches, especially the Aquatimer bezel and Ingenieur hands. Not bad – will look at it when it falls to street prices. 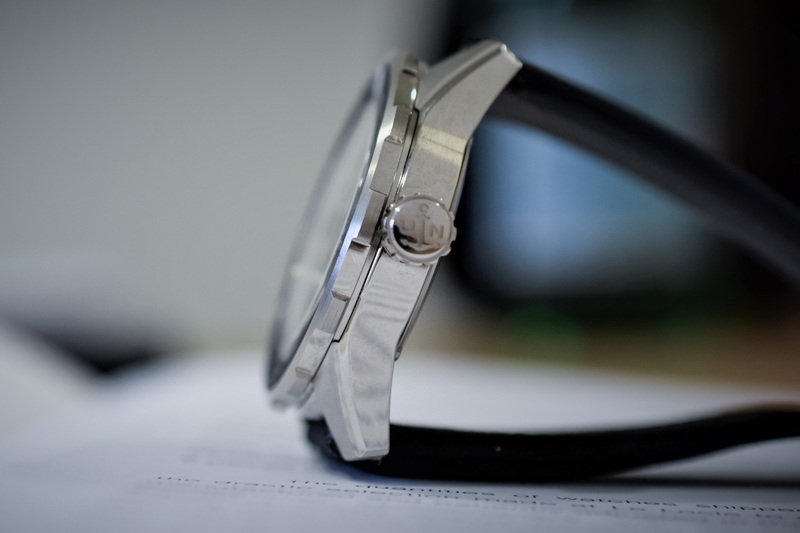 My main worry is about the bezel – does anyone know if that is a rubber inlay? I hate those and feel that they really cheapen a watch; alright it’s not too bad at this price level (though it would still be a no-no for me), but those rubber rings around the dials of Freaks are an abomination! someone said Sellita? ?…someone said 5’800 bucks?? ?…well, what a clever trick all these brands that build new facilities and show blasting balances have…get a movement who market price is $280…case it in a fancy case use the name of a brand that was established on the roots of traditional horologic values and sell it for 20 fold higher price….ooops, wonder when the hype will be over….sad, very sad…. Or, you could get a Seiko SPB077 that looks better and actually has a legit in-house movement for just over a grand. Sure, you don’t get that extra 100m of water resistance but who is going down 300m anyway??? Seiko really makes it hard to take any of these Swiss brands that use 3rd party movements seriously. Especially when they are charging several thousand dollars for them..
Is the UN brand worth a 600% markup on similar offerings from decent watchmakers (not all microbrands)? Keep trying. Is the UN brand worth a 600% markup over similar offerings of decent manufacturers (not all of them microbrands)? Keep trying.